Make this holiday season merry and bright with our charming Glow Anywhere LED Christmas House! From the whimsical design to the adorable accents, you'll love everything about this battery-powered LED outdoor Christmas decoration. In addition to its stunning look, our Glow Anywhere LED Christmas House is also eco-friendly. It can be set to turn on automatically, and then a five-hour timer shuts it off for maximum energy efficiency. Because it's battery-powered our LED Christmas House can be used anywhere, from your living room to outside in your garden and beyond. It features a resin exterior for durability indoors or out. Just two D batteries will power this glowing light for up to six months. 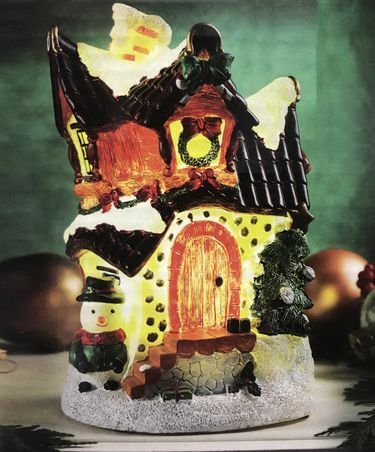 The Glow Anywhere LED Christmas House measures 5.5" x 8.75"H, making it a convenient Christmas decor item for any space. No wires, durable resin, set it and forget it lighted garden decor!